Marketing has reached a level that it is not just about funnels and conversions, but all about tools and its usage. It has moved from the traditional framework to data analytics and cloud-based operations. With the changing mindset of the consumers, this makeover is forcing marketers to reassess their strategies and their tools. The success of today's marketing strategy is linked to the adoption of digital technologies capable of giving an upper hand in the competition. Implementing automated marketing strategies and tools can help create a responsive system. In addition, this will help the executives to channel their time to other productive work. With the ever-increasing pace of changes today, businesses cannot survive without some degree of marketing automation. Given the turbulent environment, it has become vital for CIOs and CMOs to pick the ideal technologies and opt for the best vendors that are at the frontline of optimality tackling the real explosion in the marketing automation scale. In order to assist CIOs in identifying the right marketing automation solutions, a distinguished panel comprising of CEOs, CMOs, CIOs, VCs, and analysts including Marketing Tech Outlook editorial board have selected the leading firms that offers best-of-breed technology solutions and services in the Marketing Automation landscape. The selection panel looked at the vendor’s capability to fulfill the need of buyers with effective solutions that curb challenges and promote business growth. 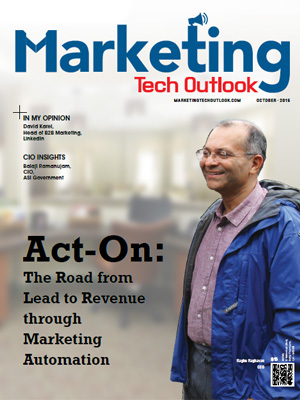 In this edition of Marketing Tech Outlook, we bring to you “Top 10 Marketing Automation Solution Providers”.